The shameful and humiliating defeat suffered by South East governors, Nnia Nwodo’s Ohaneze Ndigbo and other self proclaimed saboteurs, at the hands of IPOB as a result of the successful sit-at-home protest on the 14th of September 2018, will go down in history as the singular most memorable episode since after the war that returned leadership of the east back to the people. For the first time since Yakubu Gowon and the Fulani caliphate appointed the Ibadan based betrayer of Biafra, a certain Ukpabi Asika, to manage the affairs of the defunct East Central State on behalf the caliphate, we the people of Biafra have on September 14, taken back the governance of Eastern Region from the Fulani appointed Igbo governors and leadership of Ohaneze Ndigbo. The humiliation they suffered at the hands of IPOB will accompany them to their graves. No amount of whitewashing the truth through sponsored media publications, will save them from the eternal torment of knowing that despite their huge federal allocations, IPOB defeated them at their own game and in the process revealed to the world that these are leaders without followers. Without financial backing from the north and power of office, they are empty and irrelevant devoid of popular mandate. Our people have truly shown and proved to the entire world that IPOB is the only group mandated to speak for the entire eastern region. If South East governors, Ohaneze Ndigbo and other saboteurs feel they are in control of the region, we challenge them to issue a command to see if the people will listen to them or not. They are welcome to test their popularity and acceptability. The masses have no regard for them because they have been exposed as the collaborators and quislings they are. Henceforth they will be booed and heckled whenever they show their corrupt faces in public assuming they are shameless enough to appear in public after this. Ohaneze Ndigbo and Igbo governors are no longer mandated to speak for the people because nobody listens to them. We know the best they can ever do is to issue meaningless press statements and comments on the pages of newspapers. 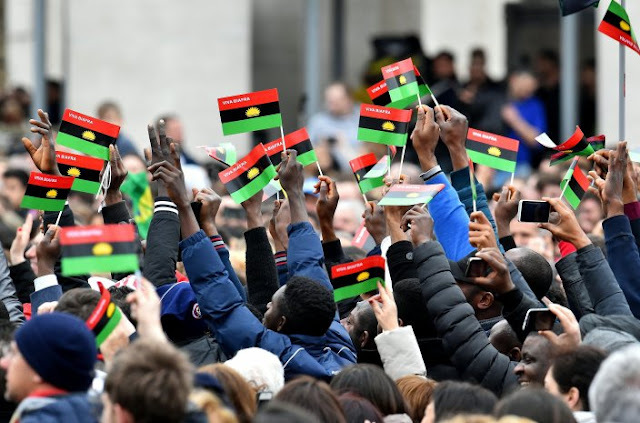 A quiet revolution led by IPOB has taken place. The old corrupt order has been swept aside. Only a fool will regard South East governors or Ohaneze Ndigbo as significant in the affairs of the east. The masses are no longer interested in their politics of self preservation and betrayal. We must one again thank the people of Awka Ibom, Abia, Anambra, Bayesa, Ebonyi, Enugu, Delta, Imo, Rivers and diaspora Biafrans for the unalloyed support showed to our leader Mazi Nnamdi Kanu and his parents and for the mandate given to IPOB to speak and liberate the Biafran people from this barbaric 'geographic expression' created by the British in 1914. We are proud of you and proud of the support and success we have achieved together so far.